I only have one child now in elementary school and she's been doing all her art projects in school. Angel only brings the required materials to school and sometimes brings the finished project after her teacher graded it. Below are the projects I was able to get pictures of. Note: By the way, I'm not so sure if these projects are really simple. Well, my daughter is in Grade 4, so definitely these are not easy for the younger ones. 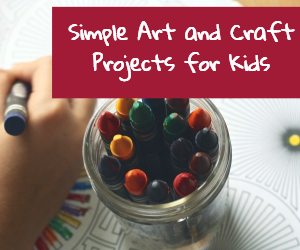 Sometimes, the teacher asks her class to prep for their art project. Like for this art project, my daughter had to do the cardboard stencil at home. 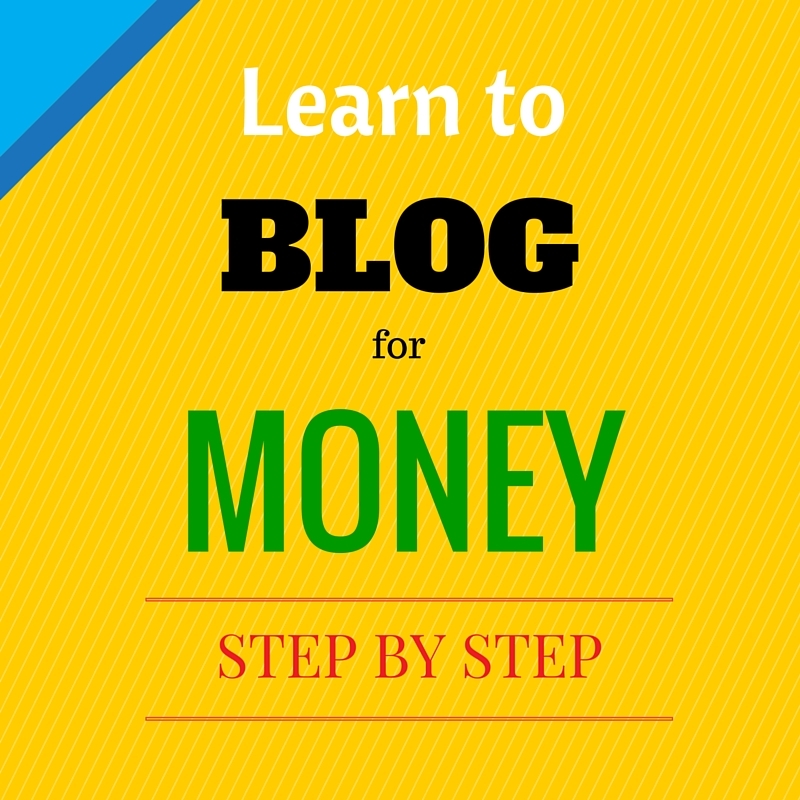 Here are the steps on how she did this. 1. Draw a rose on cardboard paper. 2. Cut out the outline of the drawn picture. Don't cut all the way through the outline or the picture won't hold its shape outline. 3. Apply poster color on the rose cardboard stencil. 4. 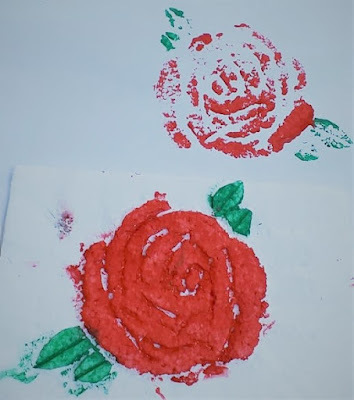 Press a piece of bond paper on top of the cardboard stencil so that the rose is stamped on the paper. The stamped rose on the bond paper did not completely copy the shape and outline of the rose. Maybe she could have stamped and pressed the paper firmly on all sides to get a good stamp. Thanks to her teacher for posting this picture on Facebook. Her next project is a tie dye shirt. The materials needed are dyes and a shirt. We bought 3 colors of Venus brand dye - blue, red and yellow. 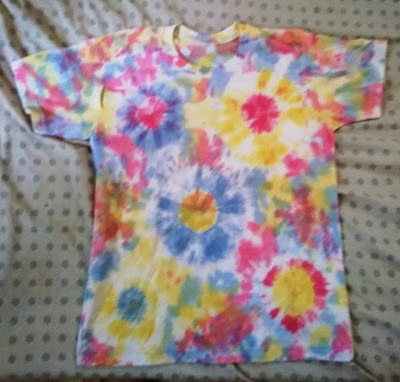 I won't go into all the details of making the tie dye shirt. 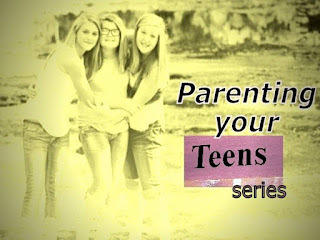 If you want to do one, you can search online for instructions like this page. 1. The dye was dissolved in lukewarm water and placed in 3 squeeze bottles. 2. Tie the shirt, according to a pattern that you like, such as spiral, polka dots, rosettes, crumpled look, etc. 3. Apply the dye on the shirt. 4. Put the shirt in a plastic bag and let it sit for at least 4 - 6 hours. I think Angel did a nice job on this one. 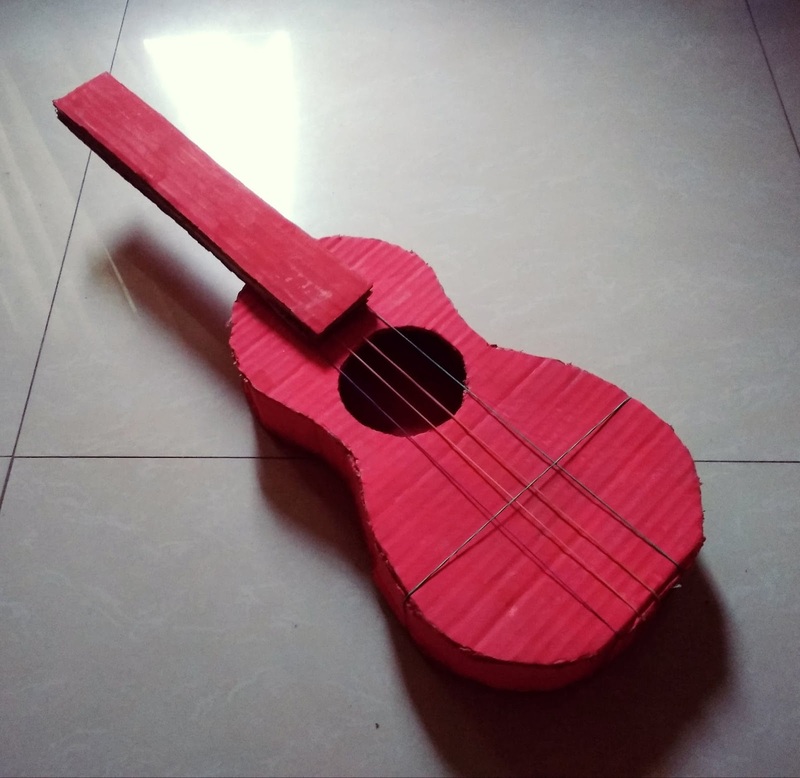 In this next project, Angel's teacher asked their class to make an instrument using recycled materials. When she asked what materials she could use, I said cardboard, plastic bottles, cans, etc. She chose to use cardboard boxes. We have plenty of cardboard boxes acquired from the grocery when we go shopping. She looked on YouTube for some tutorials on how to make a guitar out of cardboard. She was able to do it on her own. Her only problem was how to make it produce sound. So, we thought of using rubber band. But she could have used the broken nylon strings from her brother's guitar also. This is how her guitar looked like. Honestly, I don't know how to crochet. I tried to learn it when I was young, but gave up. Angel was excited when they were asked to buy a crochet kit for beginners. It included a crochet hook, yarn and the instructions/crochet pattern. 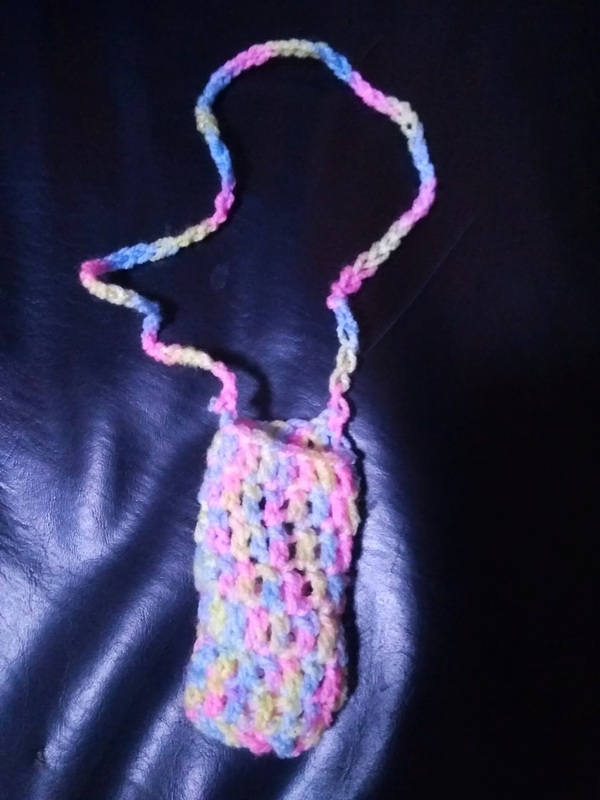 When she got her crochet kit, she went to work and was able to make this crocheted small bag. I'm impressed.